“I think that after 50 years of policy that had not changed on the part of the United States, it was my belief that it was time to try something new, that it was important for us to engage more directly with the Cuban government and the Cuban people. And as a consequence, I think we are now in a position to move on a path towards the future, and leave behind some of the circumstances of the past that have made it so difficult, I think, for our countries to communicate. He went on to promise his neighbors that the days in which the US felt it could meddle with impunity in their affairs were over. US reporting on Castro’s speech tended to dismiss it as an instance of a Latin leader getting carried away with himself. But the US did in fact try to assassinate Fidel Castro and backed an invasion of the country aimed at overthrowing the government. It is often forgotten that these actions were taken not because Cuba committed an act of war against the USA but because Washington disliked the system of government that Havana adopted. 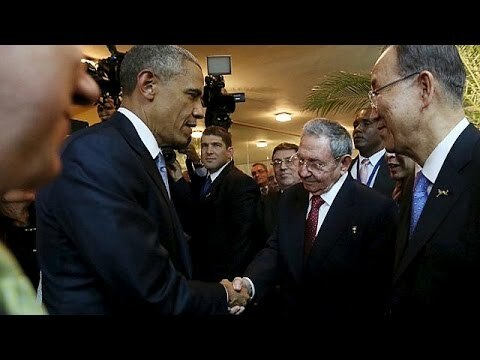 Obama had to promise not to engage in any further attempts at a coup in Cuba because the USA has been in the coup business for a very long time, as part of the way it has run its empire. Some observers count 51 US military or covert interventions in Latin America since 1890. Quite apart from the Cold War covert ops, the US intervened militarily in Cuba no less than four times in the late 19th and first third of the twentieth century. Then, Obama also had a sidebar meeting with President Nicolas Maduro of Venezuela, in which he apparently tried to calm him down by promising that Washington was not trying to get up a coup against him or overthrow his government, and did not see him as a threat. Maduro suspects the US conspired with right wing forces in an attempted coup against his predecessor, Hugo Chavez, in 2002. And he fears that when Obama on March 9 of this year designated Caracas a threat to American security and imposed sanctions against seven Venezuelan officials, it was a prelude to another such covert op. Hence Obama’s attempt to mollify him– though Obama insisted on maintaining the sanctions, since he said those were against human rights violators. His March 9 executive order has been criticized by most other Latin American countries, including Brazil, which is often critical of Venezuela and has tended diplomatically to be closer to the US than the left-leaning ALBA nations. In short, Obama’s diplomacy at the Summit of the Americas in part consisted of going around promising not to overthrow his fellow leaders, which would be faintly ridiculous if Washington hadn’t in fact intervened so much in neighbors’ affairs. The Obama moment in Latin America most resembles president Franklin Delano Roosevelt’s “Good Neighbor Policy” during the Great Depression and WW II, when FDR similarly ceased trying to impose the US will on countries it its south. (Unfortunately in the Cold War period, the interventions were revived). It is worth pointing out that one of the reasons Obama has difficulty in his negotiations with Iran is that its leader, Ayatollah Ali Khamenei, distrusts Washington because of its long history of intervention in Iran. The US along with its WWII allies invaded and occupied Iran in the 1940s; the allies overthrew the ruler, Reza Shah Pahlevi in 1941. The in 1953 the CIA conducted a coup against popular Prime Minister Mohammad Mosaddegh because he led the nationalization of Iranian oil. After the 1979 Islamic Revolution of Ayatollah Ruhollah Khomeini, the US allied with Saddam Hussein of Iraq, who had invaded Iran in a wanton act of naked aggression in 1980. When Saddam used chemical weapons against Iranian troops, the US ran interference for Baghdad at the UN Security Council, ensuring that Baathist Iraq was not sanctioned for its war crimes against Iran. So maybe Obama needs a sidebar with Khamenei to reassure him that Washington is not trying to overthrow him, either.